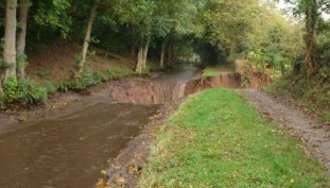 THE emergency repair to the Mon & Brec Canal embankment has proved unsuccessful and it looks likely stop planks will be required. Water is still gushing out over a road and into fields though work has been in progress. It seems the concrete channel has obviously broken up caused by earth movement, Keith Gudgin reports. Canal & River Trust state that 'further investigations and repairs to this section of canal will be undertaken to control the flow of water'. The Mon & Brec is renowned for its many failures and breaches, as it is built on sandy soil that is susceptible to movement causing its banks to give way. There have been many breaches on the Mon & Brec with one on the 27th February 2010 in the pound that was repaired after the 2007 bank collapse, with the pound between bridges 116 and 118 drained to protect properties below. The photograph shows the worst of the breaches. Later that year on the 1st September the embankment by the aqueduct at Llangattock gave way. Then on the 27th October 2012 the waterway was closed after another 'serious leak'. Then on the 7th January 2014 there was embankment movement, again at Llanfoist. Little wonder the residents below the waterway are concerned, they have every right to be, as the Mon & Brec is keeping up its description of being 'the most fragile of the canals'.